In previous years I’ve sketched the birds I’ve seen during the Big Garden Birdwatch survey. This time I thought I’d try and model them in clay instead, sculpt them directly during the hour watch. It is a wonderful challenge, requiring me to work very quickly, where normally I would be slow and meticulous to get a likeness. It is a frenzy of pushing and squeezing the clay in a mad hurry before the bird disappears. There are a few moments after it has gone, when the image is held in the mind and more clay shaping can be done – but then that too disappears and I wait poised, willing the bird to appear again. I started with a Siskin, a pair came to the feeder and they’re such pretty birds – but shy and are bossed away by other birds. The only thing I managed was a slim shape and tail with rounded fork, and a vaguely finch like beak. 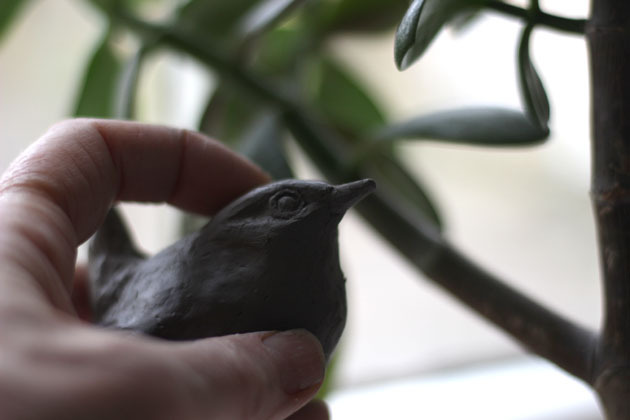 A wren was ever present and became my ‘bird of the watch’ this year and I sculpted one or two during the hour. At one stage a huge gathering of Jackdaws rose in the sky, so full of Jackdaw screams and squabbles and barks, and went around, up, down and back, in a dizzy moving whole – seeming to enjoy the wind and the rally, chasing and somersaulting. Among those counted were Blackbird, Robin, Dunnock, Pheasant, Magpie, Wagtail, Sparrow, Partridge and Pigeon, and I saw Fieldfares fly over and heard Buzzard. so many! your wren is sweet. I can’t imagine trying to do it. I’ve been seeing the usual cardinals, chickadees, titmice, sparrows, doves, an occasional crow, a few warblers but I think they have moved on now, and goldfinches. but where are the blue jays? Looking back at all my counts the bird species do vary, and I wish I’d kept a better record of what I was feeding and also the plants that are growing. One year I cut back all the seed heads early and it really affected how many bullfinches and goldfinches I saw. Do you normally have blue jays round all the time? What a novel approach to the survey! I am doing mine today (last day for the 2019 survey) and your creativity has made me wonder whether I might attempt a Haiku (or even a Loku!) for each species I see. What an exquisite Wren. Ours is particularly elusive… but will it come out and be counted? 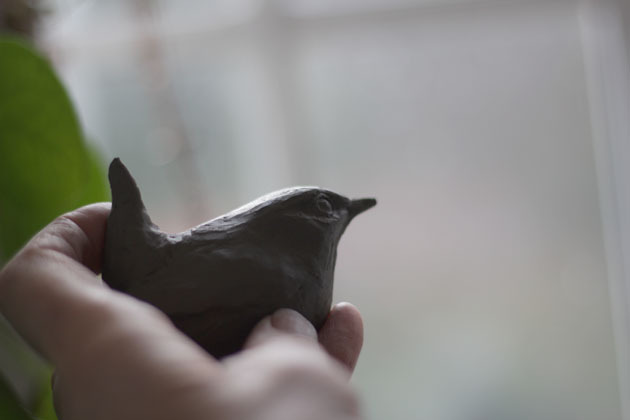 It certainly makes you look hard – and I really enjoyed working quickly – some of the time I was shaping clay without looking at it, just looking at the bird. Feeling the making, instinctive perhaps. All very interesting and simply another way of learning and improving I hope. Do enjoy your survey and yes, Loku would be great!